"A young, new master of the saxophone has arrived, and his name is Tim O'Dell . . . Before My Life is what contemporary jazz is all about and is a showcase of perfect performances." " . . . Unexpectedly grand . . ."
"Elton Dean. Tim Berne. Tim O'Dell. Welcome to the exclusive club of outstanding sax players/composers/improvisers . . . a perfect album . . . This disc is a great blend of composition and improvisation and it swings! . . .Before My Life has a uniqueness of vision. "This is a really fine recording, generous in terms of playing, with considered compositions and a ton of spirit." Composer/Saxophonist/Educator Tim O’Dell was born in Oregon in 1966 and moved to the east coast in 2001 from the Chicago scene. In Chicago, O’Dell has performed at such premier venues as the Jazz Showcase, the Hot House and the Bop Shop with some of the city's finest musicians. As a leader for Chicago's Southport record label, Tim has released several albums including his latest nationally acclaimed CD, Ancient Pines. 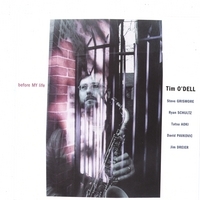 Tim O’Dell is currently very active as a composer, bandleader and freelance saxophonist performing and recording with many ensembles and in different genres. In 2007 Tim recorded a trio CD with Chicago bassist Tatsu Aoki and Boston drummer Luther Gray, as well as an entire album of his large jazz ensemble compositions in the Midwest. The Matt Langley/Tim O’Dell Quartet, a New England group featuring Luther Gray, James Lyden and all original compositions, is soon to release its debut recording The Catalyst. Additionally, O’Dell currently performs with half a dozen other New England and Chicago-based groups/artists including Richard Nelson (who recently released Origin Story featuring Tim on alto saxophone). As a recording artist for Southport Records, O'Dell has received glowing, national acclaim (see Reviews). His latest CD, Ancient Pines, featuring Tim’s writing and improvising with Chicago musicians Tatsu Aoki and Ryan Shultz, has received wide, critical acclaim as has O’Dell’s previous Southport release, Before My Life, which features ten of Tim's diverse compositions for jazz sextet. Another popular Southport album, Finally Elijah, showcases O’Dell’s improvisational gifts with former Ink Spots vocalist Elijah Levi. Tim has also released Red Fire Ant Trio: Live In Iowa City with Chicagoans David Pavkovik and Tatsu Aoki. Tim O'Dell’s recordings have been broadcast on radio stations around the world and he has been invited to appear in Brazil, Japan, Switzerland, Portugal and Greece. O’Dell has performed professionally in a myriad of genres - from symphony orchestras to Cuban bands to urban funk bands to classical chamber ensembles to (many) jazz bands - and has done so in New York, Miami, Boston, Chicago, throughout the Midwest and greater New England. Tim has had the pleasure of performing with many renowned musicians (not mentioned above) such as Danilo Perez, Tim Hagans, George Garzone, Cuong Vu, Louis Bellson, Wycliffe Gordon, David Berkman, Gunther Schuller, Mick Rossi, Willie Pickens, Muhal Richard Abrams, the Aardvark Jazz Orchestra, George Russell and The Temptations. A highly versatile, published composer O’Dell’s many dozen compositions cover genres ranging from string quartets to commissions for trombone ensemble to jazz chamber music to contemporary big band. Tim has also commissioned and premiered many new works himself including Gunther Schuller's Sonata for Alto Saxophone and Piano, Bob Washut’s Online for jazz ensemble and Andy Laster's Valori Plastici for alto saxophone, French horn and piano, which Tim premiered in New York City. O'Dell holds a Master of Music degree in Jazz Studies from the New England Conservatory and a Doctor of Musical Arts degree in Saxophone from the University of Iowa. At NEC he studied composition with Jimmy Giuffre, William Thomas McKinley and George Russell; and saxophone with George Garzone and Kenneth Radnofsky. At Iowa he studied saxophone with Ronald Tyree and Paul Scea, and composition with Donald Martin Jenni. Dr. O’Dell currently teaches music at the University of Southern Maine and at Central Maine Community College and from 1993 to 2001 was Director of Jazz Studies and Assistant Professor of Saxophone at Augustana College in Rock Island, Illinois. Prior to Augustana, Tim held graduate teaching assistantships in Saxophone and Jazz Studies at the New England Conservatory and at the University of Iowa. Tim O’Dell is a highly sought after clinician and adjudicator, and maintains a thriving saxophone and composition studio out of his home in Brunswick, Maine where he lives with his wife and two sons. Where? To scenes as amorphic as the distant future (“We Will Be There”), and as specific as the sturdy fingertips of the music’s bassist (“Mr. Aoki”). To the Homer Winslow sobriety of a becalmed sea (“Ship’s Wake”) and the synaptic hilarity of the human subconsciousness (“Id”). From the bustling symmetry of “Fire Ants” to the seraphic solo saxophony of “Angel And The Boys,” Heaven and Earth and much of what lies between. This openness, this unbounded stretch, this beckoning expanse of space that mystified and enthralled the first outsiders to see it – the prairie itself provides the perspective. Miles Davis and John Lewis, who both birthed the cool, were born in Illinois; Bix Beiderbecke, who conceived the notion in the first place with his clean uncluttered lines that point at far-off vanishing-points, was born in Iowa. Lee Konitz grew up in Chicago, pushed Lennie’s ideas toward Braxton but also toward Tim O’Dell, who like Braxton has left his mark as a composer and a classicist and the leader of ensembles on the border between the African-American and the Euro-centric. Braxton gave them to the Chicago trombonists he hired for his band, George Lewis and Ray Anderson, and aren’t we getting close to Ryan Shultz in this family tree? At the other end of the isolated straightaway, in almost Iowa, Tim O’Dell finds his common ground with these musicians and hammers together his ten-sided exhibition, irresistable portraits of ten times as many emotions, with plenty of room for them all to breathe.